Blue Buffalo has issued a recall of several lots and flavors of dog food, due to excessive vitamin D that caused illness in at least sixteen dogs. Kudos to the concerned vets who submitted the dogs’ blood samples to MSU, and to MSU for figuring out the problem! Symptoms of vitamin D toxicity in dogs include increased thirst, increased urination, loss of appetite, weight loss, and higher than normal levels of nitrogen-containing compounds, such as BUN, in the blood. 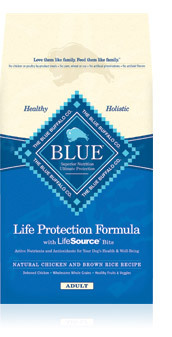 If your dog has been eating Blue Buffalo foods on the recall list, please see your vet. Urgent! Here’s your chance to vote within the next 3 days only! Ideas for Change in America is a national competition to select the best ideas from across the country and turn them into reality. In this country animals are still considered “property” according to the law- in most cases no different than a table or chair. Through the Animal Bill of Rights, the Animal Legal Defense Fund is working to show Congress a groundswell of support for legislation that protects animals and recognizes that, like all sentient beings, animals are entitled to basic legal rights in our society. The Right of animals to be free from exploitation, cruelty, neglect, and abuse. The Right of laboratory animals not to be used in cruel or unnecessary experiments. The Right of farm animals to an environment that satisfies their basic physical and psychological needs. 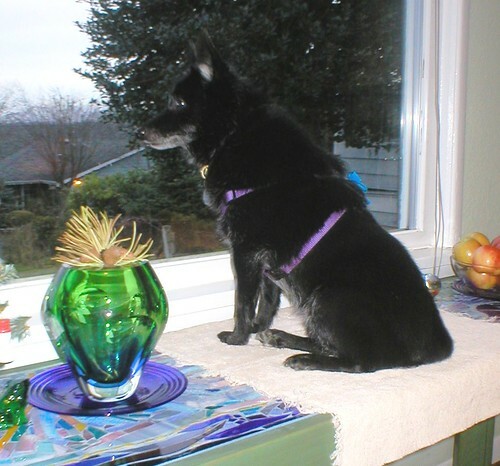 The Right of companion animals to a healthy diet, protective shelter, and adequate medical care. The Right of wildlife to a natural habitat, ecologically sufficient to a normal existence and self-sustaining species population. The Right of animals to have their interests represented in court and safeguarded by the law of the land. On Halloween and during the days before and after, do not leave your pet outdoors unattended, and most especially do not allow cats to roam. Even dogs in a fenced yard are not safe from harassment by those who may throw objects over a fence, including things that may not be safe for your pet to eat. Such activities tend to increase around Halloween. Horribly, many pets, especially cats, disappear at this time, never to be heard of again. One can only speculate as to what their awful fate may have been. On trick-or-treat night, your dog, cat, or bird may be happiest in a quiet area behind closed doors. Even pets who normally welcome visitors may be spooked by repeated ringing of the doorbell and strangers in costumes. This stress may cause your pet to behave unpredictably, to dart out an open door, relieve him- or herself on the floor, or even bite and scratch. Dogs may enjoy a filled bone or Kong to work on and stay occupied while separated from the activity, especially if crated. A bed to snuggle in, or a blanket to hide under, may comfort a scared cat. Birds may do best with their cages covered. Try to have a family member spend time with pets who are thus confined, playing with and reassuring them. Young trick-or-treaters may be intimidated by dogs who greet them at the door, or who are in the yard in front of your house; another good reason to keep your pet in a private, safe area. Keep bowls or bags of Halloween treats out of your pet’s reach, and don’t underestimate where they can find these! Dogs may eat a whole bag of chocolate bars with the wrappers still on, and experience serious consequences. Chocolate is toxic to pets and can be deadly. Many cats love pumpkin, and may be attracted to your jack-o-lantern. While pumpkin is in general good for cats and dogs, consuming too much can cause digestive upset. Be extremely careful with lighted candles; do not use them where they may contact wagging tails or inquisitive whiskers, or be knocked over. The best option is to use battery-powered candles or flashlights. Use caution with decorations and costumes. Pets may swallow beads, strings, glitter, or other materials that can cause choking or bowel obstruction, or damage the stomach or intestines. Check carefully to make sure that small parts do not come off and become available to a curious pet. Wishing you and your pets a safe and happy Halloween! Photo copyright ItchmoCommunity member. Used with permission. 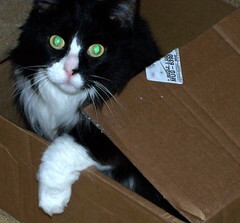 You are currently browsing the archives for the Pet Food Recalls & Safety category.